Remember our beautiful walk recently? We had such a wonderful morning and came home with about half a kilo of wild mushrooms. Because they were so fresh, I knew they would keep for a day or two, so in the first dish I made, I used half of them and kept things very simple. We grow oyster mushrooms in our garage. No, don´t worry – there´s no nasty fungus creeping up the walls or anything. You can buy bales of straw which are impregnated with mushroom spores and then wrapped in black plastic. You cut slits into the plastic and keep the “alpaca” as these bales are known in the dark and ensure that they are kept damp. About a week after acquiring your little treasure your first mushrooms will appear. Just cut and eat. Then when you´ve harvested as many as you can, you flip the alpaca over and cut a few more slits. If you keep it going you can be eating your own grown oyster mushrooms for several months. I took about the same quantity of oyster mushrooms as wild, cut the wild mushrooms into thick slices and tore the oyster mushrooms into strips. In a deep terracotta dish (or you could use a frying pan) I added three crushed cloves to garlic to the mushrroms together with about 3 good tablespoons of olive oil, some Maldon (or kosher) salt, several good grinds of black pepper and two red chillis (these are optional). I turned the heat up to high and as soon as the mushrooms began to sizzle I reduced it and covered them to let them sweat and get tender for about 10 minutes. I then removed the lid and added a small glass of dry white wine and let everything bubble away until the liquid had reduced by half. We ate this as a starter with plenty of rosé wine and some crusty bread to mop up the delicious juices. PS. On a totally different subject – since I changed the look of my blog (i.e I changed the theme) my photos don´t seem to appear properly. They are cut off on the right hand side! Has anyone come across this and do they know how to resolve it? Thanks for any advice anyone might be able to offer me. Previous postI´ve gone right off Medlars…. They sound delicious. Interestingly, I saw someone at the Farmers Market, recently, selling tree trunks impregnated with mushroom spores. Ooh – I´ll have to tell my parents about that as they want to grow some too! Hi there, #1 the mushrooms look and sound delicious,,,and what a great idea of the ‘living’ mushroom bales, I miss the variety of mushrooms we eat in Europe…slowly but surely I see varieties available in the supermarkets, but nothing campares to those wonderful forest walks and finding mushrooms! #2 Perhaps the problem of your photo’s is where you originally write your post..eg I use Windows Live. When you upload your post…maybe you haven’t yet rechanged your settings for the new theme. ! I´m a real mushroom fan but we don´t get all that much variety where I live….hence having to grow them or go out and look for them! Thanks so much for the advice, I write in word, but will have to look into Windows Live now I think. How cool to grow your own mushrooms! I would love to do that! Your braised shrooms looks fantastic. Sorry no can help on the photo problem – hope you get sorted soon. Mushroom bales. What a great idea. Would have one tomorrow if I could get them here. Good question – I think last year we spread it out amongst the olives and the chickens rolled around in it. Maybe I should go and check if we have any mushrooms sprouting up down in the little grove! I’ve been waiting to see what you’d do with these shrooms and you certainly didn’t disappoint! In the house Mom & Dad lived in when I was born, they had a room in the basement with a dirt floor. They grew mushrooms down there, although I’ve no idea what kind and no recollection of it at all. My mushroom picking starts and ends with the puffballs. I’m a chicken at heart! You are definitely NOT a chicken…the man who canned for the first time! I love that your parents grew mushrooms in their basement, I can imagine your Mamma saying to Papá … “pop down to the cellar and get me half a pound of mushrooms to put in the pasta sauce”! And puffballs….wow, haven´t had one for years and years. Simple is best with mushrooms and this sounds wonderful. Great to be able to grow your own oyster mushrooms as well as finding those wild ones! It was a good meal…as you say, simple but tasty. Olé for alpacas! And olé for your daughter spending Christmas in Barcelona. She´ll have a ball – city, beach, fantastic restaurants, the beautiful cathedral and Gaudí buildings and park…so much to see and do. Warn her that Christmas Eve is traditionally a family night, so there will be very few places open to eat at night apart from Chinese/Indian. Christmas Day people often go out in large groups so she may need to book if she is with friends…she could have lunch on the beach! I have a friend who went not so long ago and went to a fantastic, not too expensive, waterside restaurant, will try to find out the name for you. It´s safe, beautiful and very Catalán – very different from Andalucía…more cosmopolitan and sophisticated. Where did you get your mushroom thing from? I want one!! I answered your question on my blog, I’ve never had that problem with the photos, strange! Have you looked in the support forums to see if anyone else has had the same problem? Good luck, it’s so frustrating sometimes isn’t it! Wow..I had no idea there was so many varieties of mushrooms! I so wish I wasn’t allergic, I’d pull up a chair and dig in!! Mushrooms in your garage. That’s so awesome. Have you tried the help function? It helps me, no pun intended, a lot. It´s great isn´t it! And yes, am off to look around the site now to see if there is any help available…thanks Greg! I would love to have a mushroom farm in my garage or basement. I know that your mushrooms were delicious. Aha – it was your little hand pinching the mushrooms off my plate!! 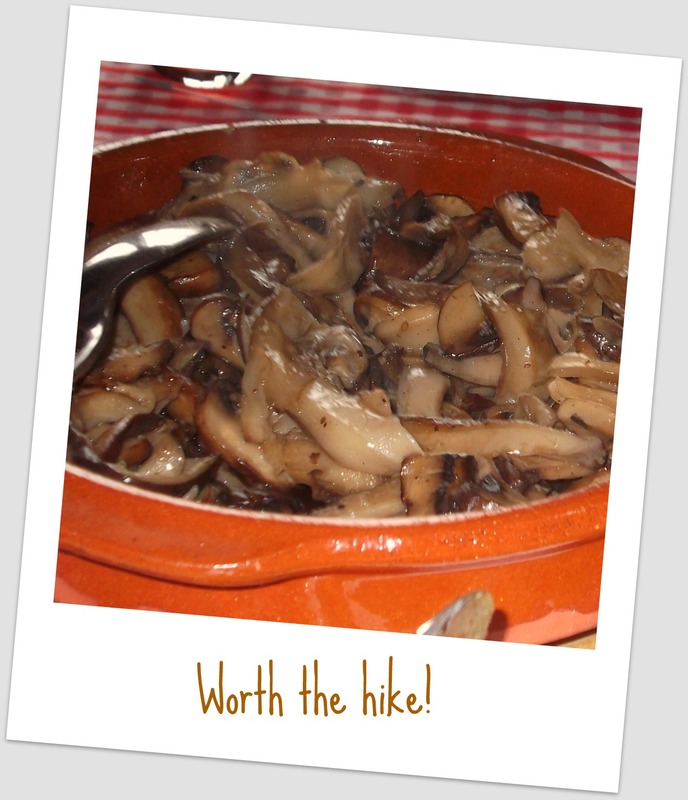 Well, it was very simple, but they tasted so mushroomy (is that a word?) that they didn´t need much else! Oyster mushrooms are one of the safest wild fungi to collect. Very little can be confused with the genus Pleurotus. As far as I know all members of that genus are edible and the common oyster mushroom, (Pleurotus ostriatus), is often found on dead elms. Good tip Ted – am trying to work out if we can introduce spores to our wood pile! No elm here – lots of oak, almond, olive and cherry though. Ooh- maybe we should talk properly one day. Come and visit if you´re ever just over the Granada province border with Malaga. You could the mushrooms in a dark spare room! E-mail me and we can “get going” on your “Plan Campestre”! Hi! I’m a new reader to your blog. I noticed that you didn’t get any replies on your photo problem. The problem is likely that the post area on the theme you chose is too narrow for your photos. I see you are using wordpress.com – are you a free user? If so, then your only option is edit your photos so they are just a tad smaller, or choose a theme that has a wider post area. If you are a premium user you can modify the code of the theme so that the posting area is wider, allowing your photos to fit just fine. Does that make sense? I’m no expert, but I’ve been using wordpress for many years now and I enjoy tinkering with it. If I can be more clear or help you out, just let me know. Thank you so very much Heather – I really appreciate your response to this and also for stopping by my blog! Yes, I´m a free user but may need to look into upgrading. Will have a little tinker with my photos to see if I can sort this out. Thank you again!